Ali is currently collaborating with colleague/mentor, Dr. Von H. Washington (retired Drama Professor from the University of Western Michigan and renowned playwright, actor and director) on a theatre project about their exploration of Black and White Abolitionists who worked on the Underground Railroad, including the great Henry Bibb, and her own ancestors, Pamela and Dr. Nathan Thomas. The world premier of this work was held on November 2015 at the Ladies’ Library in the town of Schoolcraft, Michigan, where the house belonging to Ali’s ancestors is now a National Historic Site and Museum. Friday, April 15th and Saturday, April 16th, 2016 at 8pm: Showcase at the Annex Theatre in Toronto, ON. Saturday, May 27th, 2017 at 8pm: Theatrical reading at Mackenzie Hall Cultural Centre in Windsor, ON. Attn: Von H. Washington, Ph.D.
written and directed by Dr. Von H. Washington, Sr.
Toronto artist, producer and mezzo-soprano, Ali Garrison, has teamed up with her American colleague, Dr. 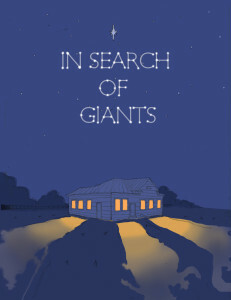 Von H. Washington, Sr., a renowned theatre professional for forty years, to bring their well-received theatre presentation, In Search of Giants to Windsor, Ontario. This production, about a personal journey leading to the discovery of three significant leaders on the Underground Railroad, has been playing to full houses and standing ovations since it began touring Michigan in November 2015. There have been numerous transnational performances since, along Michigan and Ontario Underground Railroad routes, including Schoolcraft, Kalamazoo, Albion, Ypsilanti, Ann Arbor and Toronto. 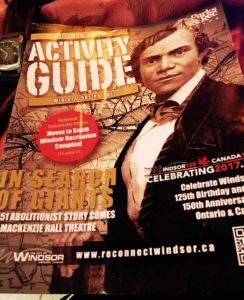 Next on its Freedom-Seeking Tour, In Search of Giants comes to Old Sandwich Town (now part of Windsor), Ontario, at the old courthouse, MacKenzie Hall Cultural Centre on May 27th, 2017. This important village along the Detroit River was where so many refugees from slavery settled, including one of our most significant Giants, the great Abolitionist, Henry Bibb. In Search of Giants is a staged dramatic reading in the traditional style of the Afrikan Griot, but uses more than one storyteller. This presentation features an international cast of modern-day American and Canadian storytellers. 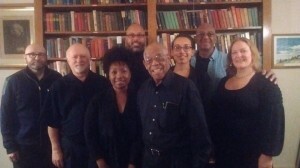 Among them are Washington and Garrison, with Von Washington, Jr., Bianca Washington, Duff MacDonald. Alicia Payne, Tim Smith and accomplished professional baritone Romeo Phillips. Musicians, Kwanza Msingwana and Darryl Huggins will open the evening. In a perpetual search for information about his ancestral past, a local college professor makes several unannounced visits to the Underground Railroad Museum in Schoolcraft, Michigan. His first visit, revealing and mysterious, brings him closer to understanding the struggles of the conductor of the house, Dr. Nathan Thomas, a Quaker by birthright. In an unrelated meeting, the Professor comes into contact with a descendant of the Thomas family and learns more about Dr. Thomas’ wife, Pamela, and the Freedom Seeker and fellow Abolitionist, Henry Bibb, who visited the Thomas house in 1844 and went on to settle in Canada. Doc also learns about a conjuring technique and a narrative story that was written by Bibb himself before his death in 1854. During a second visit to the museum, the professor goes to the room where hundreds of enslaved ancestors were hidden while waiting to go on to freedom; and there, to his surprise, he successfully conjures the spirits of Henry Bibb and others who join in to aid him in telling their stories of running toward freedom on the Underground Railroad. The Why the Sea is Salty Project is a re-voicing and popularization of an ancient Scandinavian myth about twin giantesses (!!) through interdisciplinary collaborations. This multi-phased project is a led collaboration of four culturally diverse professional artists working within their communities to create a set of interdisciplinary works, re-inventing and popularizing this ancient Scandinavian myth through theatre, literature, improvisation, graphics, singing/percussion, soundscapes, puppetry, projections and visual art. “Why the Sea is Salty” is an in-depth exploration of a marvelous, half-forgotten Scandinavian myth about Menja and Fenja, twin Giantesses who are enslaved to turn the magic millwheel, Grotti. By awakening and bringing to light new perspectives on this story we seek to help our communities to access the treasure troves of possibilities that are buried just beneath the surface of our collective consciousness. This myth is alive, a process of discovery for all participants. We are female artists unconfined by traditional specializations in art, though we are highly trained and experienced in our media. Through intuitive, educative, empowering, and co-operative methods we seek creative, professional, personal and inter-personal transformation. facilitating with gifted youth apprentices to create and publish a comic book series, called “The Further Adventures of Menja and Fenja” based on this myth. recording a set of choral improvisations with the professional vocal ensemble, the Nathaniel Dett Chorale. These recordings will be used as live soundtracks for a set of animated paintings shown during the workshop presentation. gifted youth apprentices recruited to learn alongside the artists as we ourselves learn about and develop these works. a call to artists of all disciplines to create works in response to this myth. working with performers, and singers to uncover insights into the myriad emotions and psyches of the characters within the myth. creating and publishing a picture book of this telling of the myth. 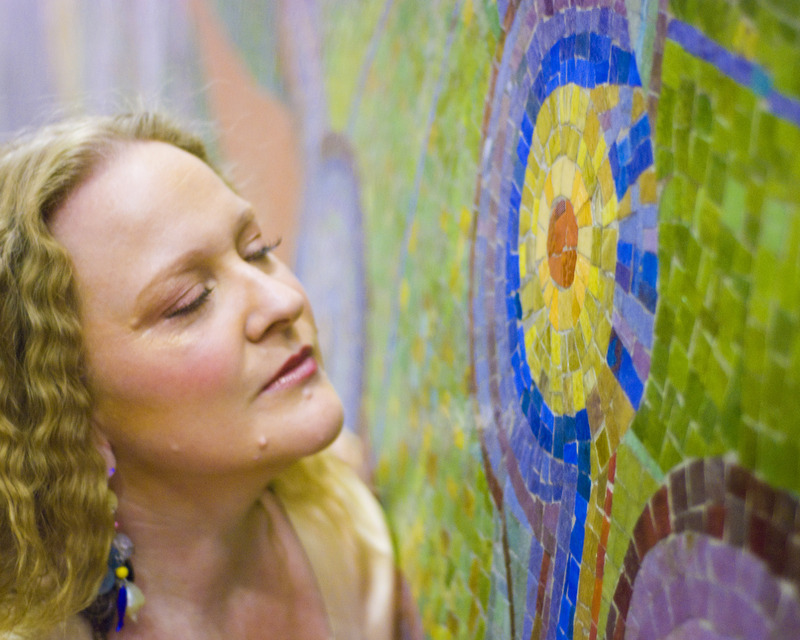 Ali Garrison, project leader, writer, music creator, performer, producer. Mosa Neshamá McNeilly, visual artist, set painter, projectionist. Barbara Croall, Isabelle Beaudoin, Marco Cinello, Jo Doughty, Mark Hazen, John Scully-Ashton, Moya Garrison-Msingwana, Myrna Scully-Ashton, Peter Mundinger, Chris Jääskeläinen, Neema Bickersteth, Andrew Gunpath, the Nathaniel Dett Chorale, Michelle-Lynn Goodfellow, Katy Harmer, Mary Alton, Manon Beaudoin, Colin Heath, Ariel Fielding, Eileen Eng, and Vinnie Sestito. My family and a smattering of my friends are gathered with me at my Mother’s grand “summer estate” which hangs right over the St. Lawrence Riverwhere it is broadest. We are congregated in “the conservatory”- the music salon. It is spacious and high-ceilinged with French latticed doors and windows opening onto balconies over-looking the river. It is a summer evening. Candles light the room, illuminating richly woven tapestries and Persian rugs on the walls and floor. There are semi–precious stones inlaid in elaborate mosaics on the table-tops and mantle and floors; jade, lapis lazuli, hermatite, amber, obsidian, turquoise, malachite, alexandrite and rose quartz. The designs are exquisite – each stone is unique, different and intriguing for its imperfections. I feel myself move in to study them up close…the colours soak into me, imbuing me, nourishing me. I completely understand that each piece contributes to a whole design and that this technicolour moment, this dream vision, is making a deep impression on my developing philosophy and aesthetic. CD will be available for online purchase soon. To receive notices about this date and more, please sign up for Ali’s Giddy Bohemian Newsletter here. Ali is currently creating a small film of The Eastern Gate (Nancy Bennett and Ali Garrison co-improvising composers). 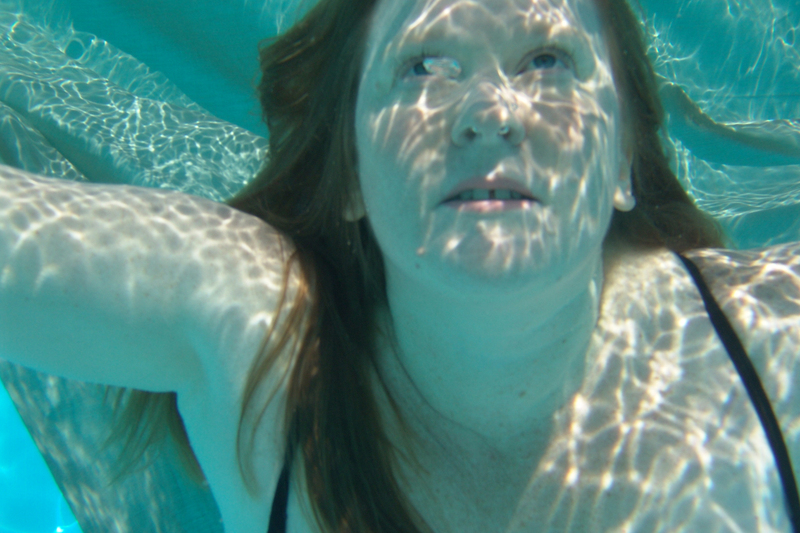 She is collaborating with the East Machais-based painter, Anne Leaver.